The Inner City SUPER Group (Service Users, Participating, Educating and Researching), aim is for people to go there and find out and share ideas about recovery. SUPER group members encourage participants to identify their dreams, find out what they want, then encourage people to use their Consumer Wellness Plans to find out their strengths and identify strategies to stay well and follow their dreams. 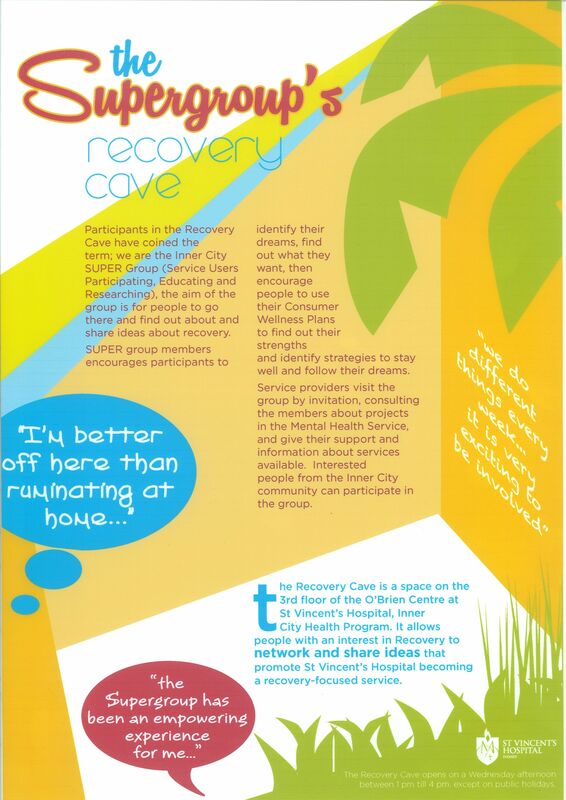 The SUPER Group created The Recovery Cave a space on the 3rd floor of the O’Brien Centre at St Vincent’s Hospital, Inner City Health Program. It allows people with an interest in Recovery to network and share ideas that promote St Vincent’s Hospital becoming a recovery-focused service. The Recovery Cave opens on a Wednesday afternoon between 1 and 4 pm, except on public holidays. Service providers visit the group by invitation, consulting the members about projects in the Mental Health Service, and give their support and information about services available. Interested people from the Inner City community can participate in the group.